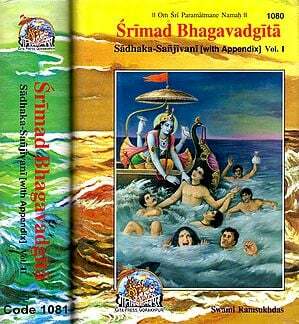 Srimad Bhagavad Gita is now widely recognized as a Scriptural Text of worldwide importance. It was Sri Sankaracharya who first brought it out into prominence from the vast mass of Mahabharata literature, fixed its contents to the seven hundred verses that now constitute it, and produced the first extant commentary on it. Not only that, he gave it the status of one of the Prasthanas (Foundation Texts) of Vedanta, and the lead he thus gave has been accepted by all succeeding Acharyas of even schools of Vedanta that are opposed to his school. Therefore, for all lovers of the Gita the interpretation that the great Acharya gave to this Text is of great importance. 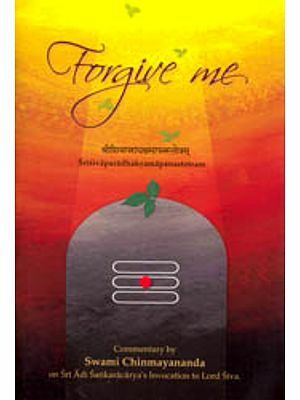 The present work, giving both the Sanskrit text of Sankara's commentary and its exact but lucid English translation by Dr. A.G. Krishna Warrier, is an attempt to meet the needs both of Sanskrit scholars, and of those who can approach the contents of the commentary only through the help of the English language. The translator, Dr. A.G. Krishna Warrier, is a retired Professor of Sanskrit and Tagore Professor of the Kerala University. He is an accomplished scholar in Vedanta Philosophy as well as in modern Western Philosophy. He has to his credit several books on Vedanta, two of the most important of them being 'Concept of Mukti in Advaita' and 'God in Advaita'. He was for some time a Visiting Fellow of the Indian Institute of Advanced Study. There has been persistent demand from our readers from an edition of Srimad Bhagavad Gita Containing Sri Samkaracarya’s commentary on it in the original with a lucid translation in English. We have therefore great pleasure in presenting this volume with the Sanskrit original edited and translated into English by Dr. A.G. Krishna Warrier Curator, Adayar Library, Madras, Dr. Warrier who is an accomplished Sanskrit scholar and also well versed in philosophy both eastern and western has worked in several centers of learning and has to his credit a number of outstanding works like God in Advaita concept of Mukti in Advaita and a Malayalam rendering of Sri Sankara’s Brahmasutra Bhashya. The discerning reader will not how the English translation in this book makes pleasant reading without loss of precision or fidelity to the original. We are extremely grateful to Dr. Warrier for this labor of love. A charming feature of the Sanskrit language consists in the linked sweetness of its samdhis words run together euphoniously to form long rolling phrases. This however poses a problem to most of the readers who cannot be expected to be familiar with the intricacies of Sanskrit grammar and so are put to the trouble of having to delink the words carefully in order to understand their purport. We have therefore thought it expedient to split the long phrases, so that each word stands by itself as in English and other modern languages. We crave the indulgence of the sticklers fro Paninian grammar for this innovation meant for the convenience of the many. May Sir Samkara’s dauntless exposition of the nature of the Ultimate Reality strengthen in us the conviction that man is essentially spirit and it is the forgetfulness of this truth that causes all our misery. Samkara’s commentary on the Bhagavad Gita more than even his commentaries on the Upanisads and the Brahma Sutras has aroused heated controversy among commentators interpreters and thinkers all the world over. After long fought battle among them there is a sort of consensus among scholars today that the text of the Bhagavad Gita Samkara fixed long ago, viz 700 verses is a unitary works. Some modern scholars both Indian and foreign as a matter of course pay tribute to Samkara’s scholarship intellectual power and supreme insight they hope thus to make their attack on his commentary look as if it is their scrupulous regard for objective facts that has obliged them to indulge in it. For instance Tilak observes Sri Samkara was an extraordinary power established the system of atavistic thought on the firm foundation of the religion of the Vedas. It is no exaggeration to say that the world has not known a sage and philosopher as eminent as Samkara. He remarks that Jnanesvara has written his celebrated commentary on the Bhagavad Gita in Marathi in the light of Samkara’s Advaitic doctrines. Nevertheless Tilak rejects Samkara’s interpretation of it as sectarian and deems as objective his own view that the Gita establishes the preeminence of Karma as an independent means to win moksa or the summum bonum. In like fashion W.D.P. Hill a much admired translator of the Gita writes. The famous of the Advaita School of Vedanta philosophy Samkara was a brilliant scholar gifted with one of the acutest intellects in history. His Gita bhasya is full of keen argument but not even the subtely of a samkara can conceal the fact that the Advaita and the Gita systems are not at one. Nor is he able, in face of plain texts to the contrary, to make good his claim that the Gitä severs action from knowledge, the latter alone qualifying the aspirant for release.”4 Hill speaks of undue emphasis on the power of knowledge. But it may be noted that Hill refuses to face the force of texts5 like BG.4.37 and 38. He concludes his critical remarks thus: The Philosophy of the Bhagavad Gita more nearly approximates to that of the Visistadvaita, though he demurely protests in the words, ‘Ramanuja errs perhaps in excessive emphasis on Bhakti’. 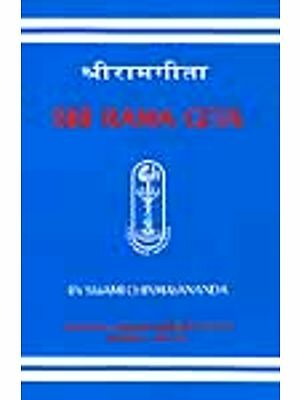 We may also note at this juncture a very recent and subtle attempt to extol Ramanuja’s interpretation of the Gita— that of R.C. Zaehner, Spalding professor, who succeeded Dr. Radhakrishnan in that chair. He talks of the founder of the extreme school of Vedantic non-dualism, Samkara, and of the commentary of the “modified non-dualist Rãmanuja, so much nearer in spirit to the Gita.” Zaehner however has his own fears that he may be taken as “trying to read only his own interpretation into the Gitã,” A careful reader of his own voluminous work may easily find out that his object is to find a common ground between the Bhagavad Gitã and the Catholic theology on the basis of personal mysticism—eternal Jivas and a Personal God being the basis of love or Bhakti. In the confusion naturally caused by this multiplicity of interpretations, the independent reader who seeks to understand the Gitä as a well-knit text based on reasoning and spiritual insights has no other alternative than to study Samkara’s commentary in its entirety. The present situation as regards Gitã scholarship is intriguingly paralleled by the one which confronted samkara when he took up for explication this universal text of religious philosophy. Witness Samkara’s remarks in the introduction to his commentary on the Gita but its sense is difficult to grasp. Many have striven to elucidate its words their imports and their totality as a reasoned treatise. The public however has got it as a mass of self contradictory ideas. Noting their plight I shall set forth its contents briefly elucidating the text with due discrimination. Therefore now as in Samkara’s days the discriminating student has no option but to turn to the guidance offered by him. Hence it is of the utmost importance to follow Samkara’s subtle has no option but to turn to the guidance offered by him. Hence it is of the utmost importance to follow Samkara’s subtle arguments as painstakingly as loyally as possible to get at the heart of the perennial philosophy embodied in the Gita. 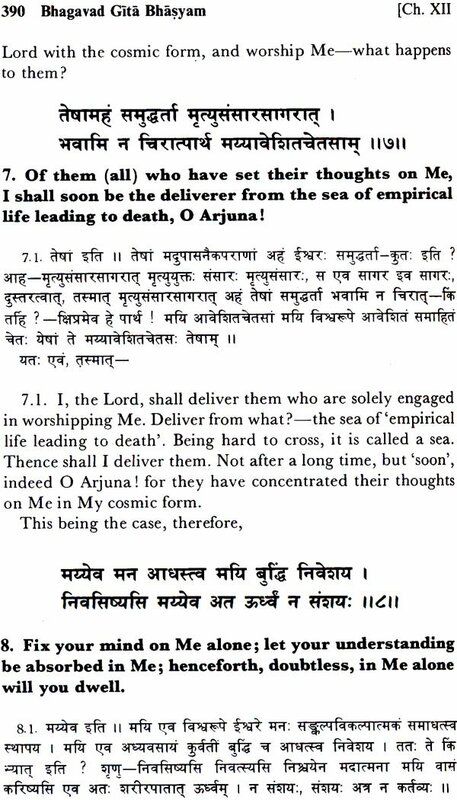 The aim of the Gita is not to exalt the way of Karma as Tilak would have us believe over the ways of Jnana and Bhakti Samkara makes this clear at the very out set Succinctly the purpose of the science of the Gita is to set forth the summum bonum consisting in the total cessation of Tran migratory life and its causes. Note that in contrast Tilak writes that the aim of the Gita is to set forth Karma yoga which is rooted in Jnana in which Bhakti is dominant and which ultimately lead to moksa Jnanamulaka bhaktipradhana karmayoga. Tilak does not seem to have attempted a formal definition of Moksa though he has devoted several pages in his Gitarahasya to the repudiation of Samkara’s ideas on this pivotal concept. We shall examine briefly in due course Samkara’s attempts to substantiate his well though out doctrine of Moksa in the light of Gita statements on it. In this connection it is of the utmost importance to remember the Advaitic emphasis on the doctrine of adhikara or eligibility and competence. An elaborate elucidation of it may be found in B.S.B whose upshot is that he alone is eligible of Moksa who is equipped with the Sadhana catustayam or fourfold discipline. In its briefest form adhikara is that state of mind which wholeheartedly prays asato ma sadgamaya tamaso ma jyotirgamaya mrtyorma amrtam gamaya. Lead me from the false to the true from darkness to light and from death to immortality. That the Gita seeks to liberate man to make him free by revealing the light of truth is indisputably clear from its carama sloka or valedictory verse whose climax is moksayisyami I shall liberate you. 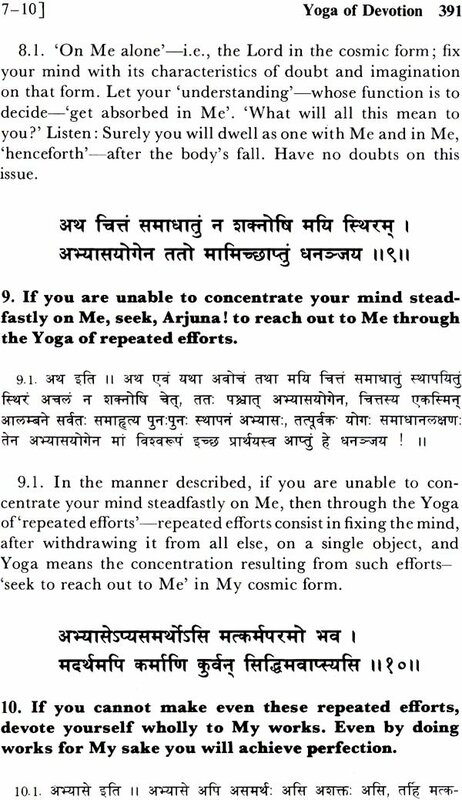 Whether this verse is taken to stress bhakti or jnana is a matter of detail it points to emancipation or Brahmabhava or attaining the nature of Brahman.